I took off recently for a quick two day sail in Casco Bay along the Maine Island Trail, stopping for the night and quickly day visiting some other islands. 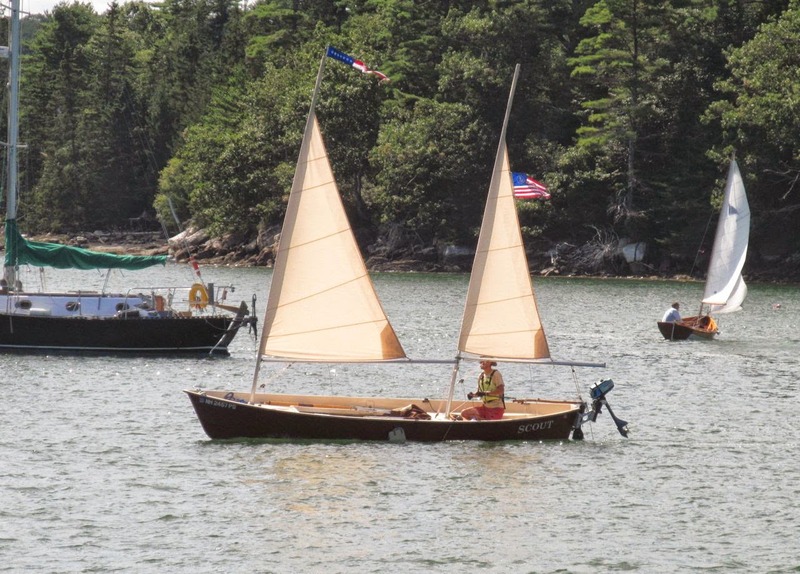 Casco Bay is nice because it has more sheltered areas to duck behind when the wind and waves really quick up, or one can vote to sail topsides, and have a spirited good time on the ocean side of the island groups. Regardless, it's a beautiful, FUN, and multi-faceted place to sail. This trip was characterized by hot, beautiful weather, and dissapointing light airs and calm seas. As some of you may have gathered, I usually do not enjoy sailing my boat on sheltered flat water, but rather large wild windy lakes with enough fetch to kick up 2-3 foot steep and tightly packed seas in a few moments, or out in the Atlantic surfing some good ol' oceanic rollers. I definitely like excitement, speed, and big water-- I want that salt spray on my face. It's good for my complexion. So the light winds were a disappointment, but it was still quite relaxing and enjoyable. On the hard on Bangs for the night. Day Two started with a row around Bangs (A), a quick row to Crow Island (B) between Bangs and Chebeague Island, and a brisk sail to Chebeague (C) for muffins. Then, a sail to Jewell Island (D) to Little Cheabeague (E) back to South Portland (F). Lobstermen doing their lobstering thing. Big Chebeague from Bangs... muffins await me here! After Big Chebeague I sailed to Jewell Island. Jewell is a large state owned and MITA managed island with multiple campsites, anchorages, historical military installations, and natural splendor. However, the big win for me on this island was running into this Michalak designed Cormorant named "Sea Fever" and built by Garth from New York. Garth and his family cruise "Sea Fever" around New England and have even done an epic multi-month cruise from Florida to the Bahamas. Hell Yeah! After Jewell I ghosted back to South Portland via Little Chebeague, and sadly, back to my car and home. Ship Shape and Bristol Fashion! Great 2 days. Muffins on L Chebeague...man I want to cruise with you (esp. if they are gluten free muffins). Plenty of room for gear?